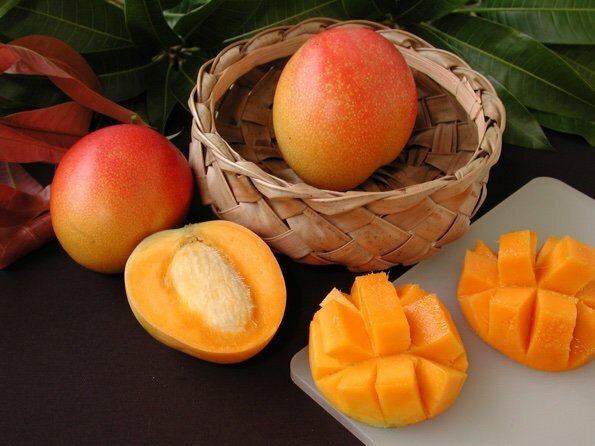 &QUOT;HADEN&QUOT; WAS THE FIRST SUPERIOR MANGO CULTIVAR SELECTED AND NAMED IN FLORIDA. THE FLESH HAS A FULL SWEET FLAVOR, AND IT IS OF EXCELLENT EATING QUALITY. THE FRUIT IS EYE CATCHING HAVING A DEEP YELLOW BASE WITH A CRIMSON BLUSH. THE TREE IS A VIGOROUS LARGE GROWER WITH AN OPEN ROUNDED CANOPY. THE ONLY PROBLEMS IT HAS ARE DISEASE RESISTANCE AND A TENDENCY TO HAVE &QUOT;JELLY SEED&QUOT;. THE FUIT ARE SUSCEPTIBLE TO SPOTTING CAUSED BY FUNGUS, AND THEY TEND TO RIPEN FROM THE INSIDE OUT BECOMING SLIGHTLY SOFT AROUND THE SEED. THE HADEN REMAINS AN EXCELLENT VARIETY FOR ANYONE THAT HAS THE SPACE FOR A MEDIUM TO LARGE TREE. THE FRUIT RIPENS FROM JUNE TO JULY.